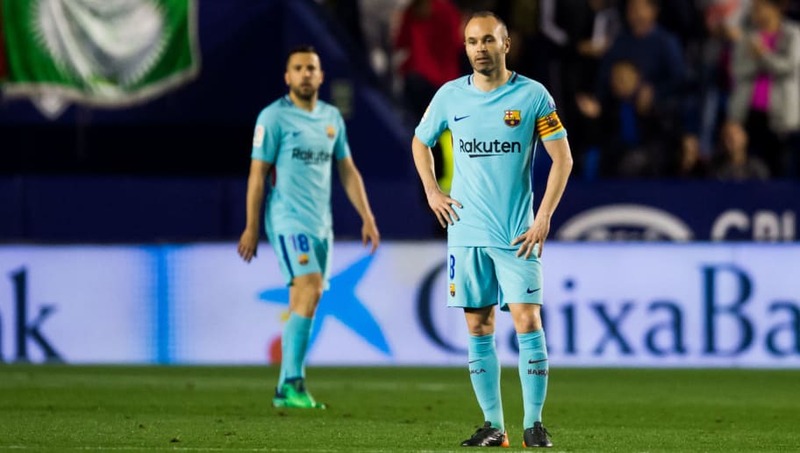 Barcelona's 36-game unbeaten season run came to a stunning end on Sunday evening as Levante claimed all three points from the nine-goal thriller, spilt 5-4. An Emmanuel Boateng hat-trick and an Enis Bardhi brace put Granotas in a commanding and mesmerising 5-1 lead before the hour-mark after Coutinho had rescued one back in the first half with the scores at 2-0. However, a superb second half fightback, which saw the former Liverpool man seal his trio for the evening, was followed up by a Luis Suarez penalty, but it proved not to be enough to halt the Seville side recording the most famous night in the club's history and ending ​Barca's history-making hopes. Welcomed to the field via a guard of honour, Barcelona looked as though they were keen to establish themselves as the dominant force early on, with control in possession and sighters towards Oier Olazabal's goal frequent during the opening exchanges. However, it was the hosts who took the initiative inside 10 minutes, as following a superb solo Jose Luis Morales run, Levante went ahead. The 30-year-old, who has found spectacular form since the appointment of Paco Lopez midway through the season, was fed possession around the centre of the area before a sharp change of pace allowed the Spaniard the opportunity to drive towards the byline. Losing their unbeaten record due to arranging a friendly in South Africa one game before the end of the season is the most Barcelona 2018 thing ever. And after dragging Yerry Mina - who was making only his third ​La Liga start - out of position, the winger laid-up a simple tap-in for Boateng from close range, although the 21-year-old seemed to do his best to try and miss the target as his attempt cannoned in off the woodwork. Just three minutes later, remarkably, the hosts, who looked destined for relegation earlier in the season, came inches away from doubling their advantage, as Bardhi found himself with the goal at his mercy, yet could only clatter the crossbar - affording Ernesto Valverde's much-changed backline a huge let off. Emmanuel Boateng is the first player to score twice against FC Barcelona in a single match in all competitions this season. After going behind, the Catalonians posed very little in an attempt to claw themselves back level, and their challenge was doubled on the stroke of the half-hour mark as Boateng slammed home his second of the evening from close range. Yet another defensive mix up - while Thomas Vermaelen was off the pitch due to injury and Gerard Pique waited in the wings to replace the Belgian - left Marc-Andre ter Stegen exposed one-on-one with the young Ghanaian, who stumbled around the German goalkeeper before shrugging off the last-ditch efforts of Nelson Semedo and blasting into an empty net. However, unlike after going one down, Levante's second of the evening seemed to stir up a response in Barcelona, and within eight minutes the Spanish champions had a lifeline. Pique, whose primary duty of the evening was presumably to tighten things up at the back following his introduction, found himself in possession inside the Granotas half before enjoying one of his typical winding but clumsy-looking runs. After dribbling his way into the opposition's final third, the centre back handed the ball to Coutinho, whose right-footed strike from the edge of the area took a wicked deflection before nestling into the back of Oier's net. But again, despite finding their way back into the contest, Barca seemed comfortable to see out the remainder of the 45 at half-speed, with very little created before Mario Melero Lopez's half-time whistle. #LevanteBarca 2-1 HT: An exhilarating first half sees Barcelona 45 minutes away from losing their unbeaten record. Levante deservedly ahead, and arguably should have a greater cushion. Barca offering very little without Messi. Can Valverde mastermind another comeback in Seville? After the break, and despite Valverde's words of wisdom still ringing in their ears, it took just 30 seconds for the Catalans to be undone once again - even though they were the ones who were in charge of possession from the restart. An aimless clearance up the field from Mina found only Campana, whose drive towards the Barcelona defence allowed Bardhi to find space on the edge of the area, and the 22-year-old did not need a second invitation to curl a stunning strike past the outstretched Ter Stegen to give Lopez's side the perfect start to the second half. And their position was improved further still less than five minutes later as Boateng became the first player this season to score a hat-trick against Barca after being played in behind the champions' defence and coolly slotting past the German goalkeeper. Levante are the first side to beat Barcelona in LaLiga this season; ending the club's recording-breaking 43-game unbeaten run stretching back to April 2017. However, the mighty Blaugrana's humiliation was far from over, as with another five-minute interval came the same outcome; a Levante goal. Roger was given the chance to take his time in possession before spotting the run of Bardhi on the right-hand side ahead of the Macedonian flicking back onto his left foot and curling his effort into Ter Stegen's net for the second time of the evening. But moments later, there was the smallest glimmer of hope handed to the visitors, as Coutinho reduced the deficit to three after eventually bundling the ball home from close range following inside-the-area pinball as Granotas attempted to clear their lines. And the Brazilian somehow managed to make the idea of a Barca comeback plausible 25 minutes from time as he sealed his hat-trick in similar fashion to his opener after a wicked deflection, this time from Suarez, did enough to wrong-foot Oier - closing the gap to two. Then, as you probably expect by now, around five minutes later, there was another goal, this time Suarez being the man to edge Barca closer to the revival of the season from the penalty spot after Levante's hat-trick hero, Boateng, turned villain as he hauled down Sergio Busquets while the midfielder attempted to attack an in-swinging corner at the front post. And just three minutes later the Uruguayan had a golden opportunity to bring the scores level as he latched onto a fizzing Coutinho free-kick six yards from goal, but the striker could only direct his header over the bar. Who Had the Most Impressive Performance in El Clasico?" However, as the clock approached stoppage time, it was Levante who had the chance to seal the win after Busquets played a blind pass back to Ter Stegen, which fell well short of the German; but substitute Ruben Rochina was unable to take advantage of the mistake and put the ball wide. But it mattered little, as after four agonising minutes of stoppage time, the referee brought an end to the evening as well as Barcelona's unbeaten record.